A couple of weeks ago I put this quilt on my long arm's frame and then it sat for a long while. Last weekend I started quilting a bit, and although I was loving doing it, I did not move fast. I think I am still a lot overloaded from QuiltCon and finding it hard to settle and quilt in my sewing room. I've finished the centre bits - this pattern is called Consider and I am hoping to get it finished and tested this month. If you are interested in pattern testing let me know (all I have to offer for your help is a free copy of the pattern and my thanks). I expect to have the pattern ready for testers by March 16. I set out to use all line based designs. 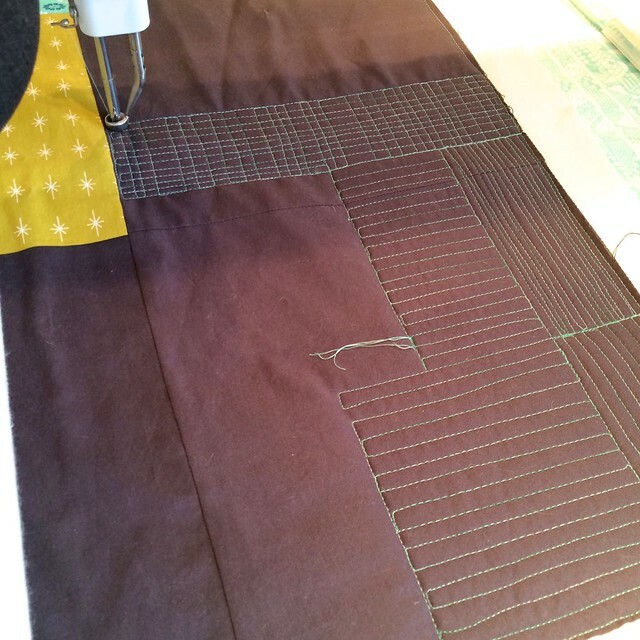 I have been reading the internet about quilting and somewhere there was a post or two suggesting that quilting lines was the easy way out. I don't care, I do as I like. And I love lines. The photos are dark, I tend to get time to do this after dinner and it is still winter. I did get one edge of the borders done with this lovely variegated Aurifil 50wt green-aqua thread using a border treatment like one of the patterns I learned in Krista Withers' class at QuiltCon. It looks great with the overall quilt. So now I need to carry this pattern along the rest of the borders, and then bind this quilt. So I am going to make finishing the quilt my March A Year of Lovely Finishes Goal - join in the link and check out the other March goals over at Fiber of All Sorts here. 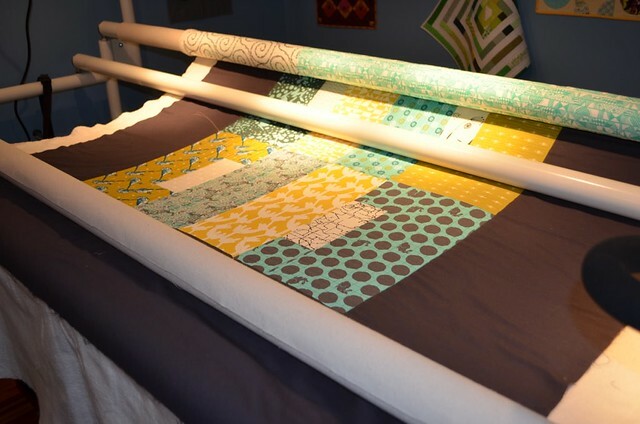 This quilt is already one of my Q1 FAL goals too, so lots of incentive to get this one done soon, which I seem to need right now. I would be happy to test your pattern:) I've been quilting for, gee, a long time(20 plus years. Let me k ow if I can help. I love your top quilting in the last photo - what a nice effect. Very nice quilting Leanne....if you need help, let me know. I will try to do just that. You found your happiness! Who cares if it moves quickly or in little slow (learning) steps. You're doing what you love and that's what's important. I like quilting lines I like it so much more than the swirly all over stuff - lines just give quilts a "cleaner" look to me and it works for hand quilting or machine quilting. 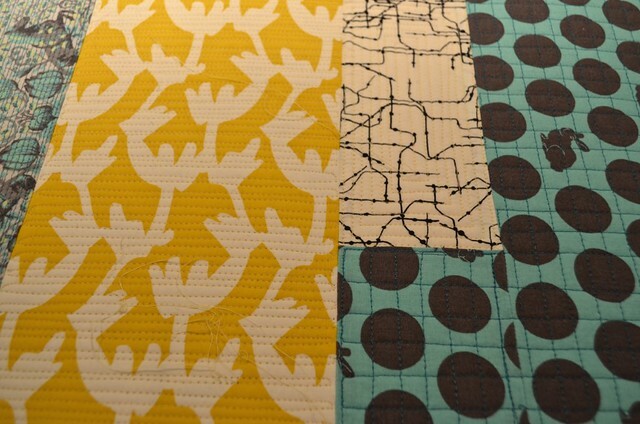 I like quilting lines as well! We should all just do as we like….. I like the straight lines as well. I'd be happy to make a flimsy for you to test your pattern. I don't quilt my own quilts. I'd be happy to do that, if it would help you. The quilt on your frame has great fabric going on. Look forward to seeing the whole thing. I better get going on my first quarter goals. One done but three still left. Yikes. I love your lines, your talent is so inspiring :) I've never done pattern testing but would be thrilled to try! Good luck with your goal! Looking good so far! You keep quilting as you like! We all have different styles and that is yours :) I like the sections of lines that you've got going on in this one. I can't wait to see it finished! I love your style of quilting - keep doing what makes you happy! 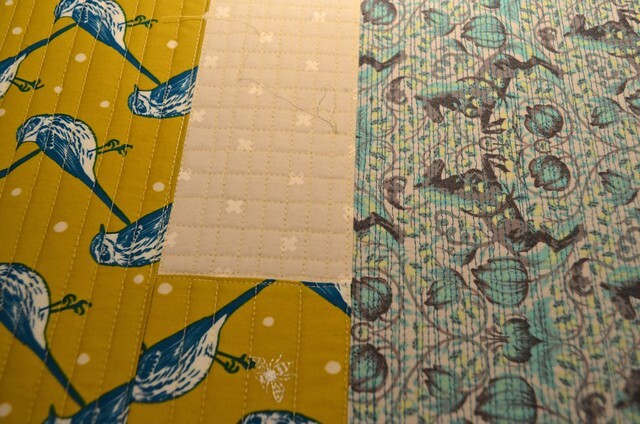 People who haven't done much straight-line quilting are the ones who say it's the easy way out! lol Yours is beautiful. Love the pattern. Good luck with your finish.